5 Guests 2 Members 8 Bots (+34 bot dupes) 1 spammer also just said hi. ChipMusic.org / Forums / Nintendo Handhelds / GBA noise/whine countermeasures? Is there a way to somehow reduce the output noise of a gba? I have tried oliver's solderless solutions, but they didn't help. For a software solution, I use Brusfri on all of my noisy GBA/Micro recordings. It has a "listen" button that you hold during a section containing just the noise, and will filter those bands out of the rest of the recording, to an adjustable intensity. It works really well, and the recording quality doesn't seem to suffer in any perceptible way. In terms of hardware, I've found the only way to get good GBA sound is to use a DS Lite, which has by far the best sound, at least for Nanoloop 2. Super clean and bassy with almost no noise. The downside obviously being that it can't be synced to any other devices.. Many thanks, pselodux. Checked out the demo of Brusfri. Shockingly good. I'd personally prefer an internal mod, though. The gba rca mod is worth doing. The contrast is equivalent to what a external mod does for regular gameboy imo. However, I've only done it on an agb 001. Im not sure how different the boards are. 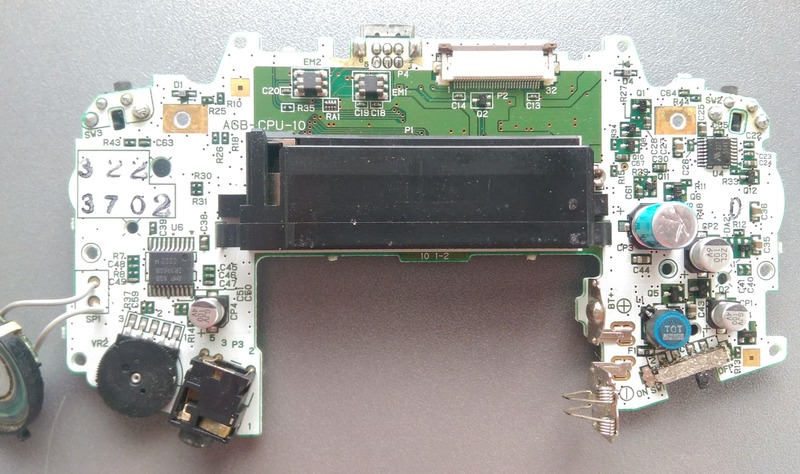 The gba rca mod is worth doing. Interesting. Is it any different from just soldering a jack between pre-amp in and ground? The GBA RCA/Pro-Sound mod is something I've been telling myself to do for a goood while now. I'm mainly composing on Nanoloop 2.7 which doesn't have the noise modification that oliver added to the later 2.8 versions and I really don't feel like updating. I also really need to order a replacment GBA SP screen on ebay or aliexpress do that AGB screen mod to get a backlight because otherwise it's just not possible to handle live.. I had to use my DS Lite in my last set just to be able to see. Has anyone got any experience with these two mods together? Does the backlit screenmod interfere with the sound any? That capacitor in conjunction with a prosound mod I assume? Would a 10Volts 1000uf capacitor do the trick or could I go even lower in voltage to avoid having a cap that's too big for the case ? Also I use a super easy version of the prosound. You just remove 2 components to disconnect the amp from the output jack, and then you solder 2 wires to connect the cpu pins to the output. If you dont like the prosound you just have to remove the wires and bridge the 2 components that you have removed. Thats exactly what it's doing. It's not completely flawless, but it helps. Those are some great protips! Thanks a lot! I personally think I'm gonna go for a separate 1/8" output jack and drill a hole in the case because I'm gonna order parts (backlit screen, shell etc.) so that I can do it all at once. But I've heard conflicting information about those points, I've read somewhere here on the forums that points R30 and R31 are supposed to be pre-pot that one should solder to for a prosound mod.. Yours and Joes pictures seem more legit! Edit: Gosh I'm blind, I just saw now that you highlighted the same points as Joe Bleeps. warning, There's not much room for more components. I had to break the inside of the case to get the rcas to fit on top. Also had to shorten and bend the prongs a little. I've read somewhere here on the forums that points R30 and R31 are supposed to be pre-pot that one should solder to for a prosound mod.. Yours and Joes pictures seem more legit! I'll keep that in mind, thanks! I have some really slim 1/8" jacks laying around and I think they'll do fine in the tight space. No bulky RCAs for me. But I'm also gonna leave the original GBA shell untouched and buy an aftermarket one.. They're pretty cheap and then if I mess up it wouldn't be a big deal. That explains a lot! Thanks for clarifying that!